Customer references indicate outstanding past performance to Open Ratings during Past Performance Evaluations (PPE) survey process. ATLANTIC CITY, NJ - February 2017 - Diakon Solutions has been rated as a top 1% performer based on the Past Performance Evaluation survey responses of its reference customers. Diakon Solutions' PPE score of 99/100 demonstrates outstanding overall customer satisfaction relative to similar companies. Diakon Solutions' score has been at least 98% since filing for D&B Open Ratings since December 2010. The PPE score is based on the survey feedback of between four and twenty verified references and is relative to similar companies during the same time period. 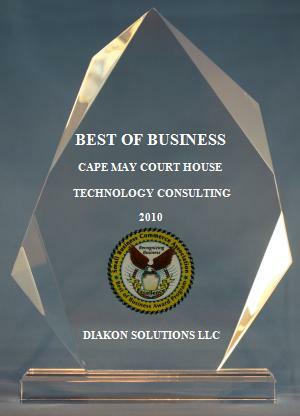 The Small Business Commerce Association (SBCA) is pleased to announce that Diakon Solutions LLC has been selected for the 2010 Best of Business Award in the Technology Consulting category. Diakon Solutions is proud to announce its selection as a "Winner" of the Forbes Enterprise Awards! After a rigorous judging process, which considered thousands of entries, The following companies have been selected as winners for the Forbes Enterprise awards. These companies distinguished themselves and are being recognized for their ideas and innovations in business. The awards ceremony will take place on February 5, 2007 at New York’s Lincoln Center.